I’m now officially in love with “Little Miss,” the adorable children’s book character from Plant a Kiss. She’s imaginative and kind, nurturing and patient. She’s bold and real and not afraid to take risks. She’s joyful. She’s spirited. She’s passionate and fun. Her heart is open to everyone. As you may know, I already adore the illustrator of this book, Peter H. Reynolds. (See The Dot & Ish.) Something about his skillful, less-is-more approach to heartwarming children’s book characters draws me in every time. 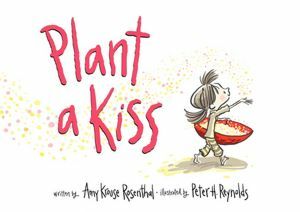 Plant a Kiss marks the first time Mr. Reynolds merged talents with NY Times bestselling author Amy Krouse Rosenthal. Whomever the powers that be… be, please tell me it’s not the last! And yet only one page of the story contains more than one sentence. Only one sentence of this entire uplifting, meaningful, enriching book for all ages contains more than four words. How is that possible? Apparently that’s what happens when you pair brilliant visual storytelling with brilliant, artful writing. You get Plant a Kiss. Am I overdoing the praise here? I don’t think so. That’s how I get when a children’s book captures my heart. This one certainly did. Fair warning: I have no doubt it will capture yours too. Links to any Inner Pieces Gallery book finds are non-affiliate links. They are provided simply for the joy of sharing good books and for supporting the work of inspiring authors. Want to show your support, too? Share this post!